We rose late and had breakfast and dropped off a load of laundry at the nearest lavanderia, before the final tour group meeting. Ale was there in the hotel lounge early, writing out cards with our tour number for us to fill out online feedback when we got home. Kim and Laura were there, and Pan and Jian, and Zaina and Zeeshan, and Olivia, and us. Andrew was apparently still sleeping after a late night out, and I don't know where Lynne and Garry were, though we had seen Garry earlier while eating breakfast. Ale collected our e-mail addresses in her diary, while I handed out my photo cards so the others could check out my photos from the trip. Then farewells were said and we handed over an envelope with collected tips - we were a little generous with ours as we thought Ale had done a great job and we'd enjoyed everything on the tour. Hugs were shared and officially we were no longer a tour group any more. During the night, I had taken a turn for the worse. After being exhausted by yesterday, I hadn't felt very well. Then after going to bed I woke up soon after and had to race to the toilet, where it became clear I had developed a case of diarrhoea. I swallowed a couple of Imodium tablets and went back to bed, but had to make another dash to the toilet a couple of hours later, prompting another tablet. By the morning, my system had mostly regularised, and I was feeling better. M. and I left the tour meeting, stopping in our room to get organised before setting out into Cusco for some shop browsing and to go see the Inca Museum. M. went into a bag shop we'd been past before and bought herself a colourful woven handbag, getting the price down from 90 soles to 85. 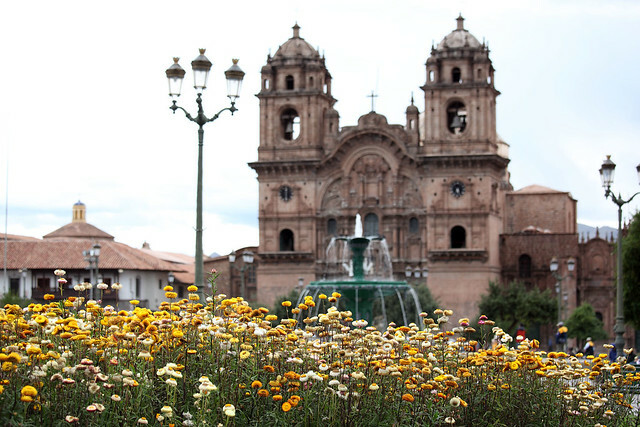 The Inca Museum was nearby and we paid our 10 soles entry fees and perused the exhibits. It contained a lot of pottery items from various regional cultures and ages. There were also many older items, from pre-ceramic South American cultures: stone scrapers, knives, boners, axes, and so forth. There was a general progression from older to newer cultures, and once the ceramics began there was no holding back, with lots of items on display. Later on came metalwork, with silver and bronze and a bit of gold, presumably most of the gold stuff is in the bigger museums in Lima. There were practical ceramics: pots, containers, drinking vessels, plus miniature versions of the same used as grave goods. Then there were some truly giant pots used for storage. We got to the late Inca period and there were all sorts of implements: pins, combs, mirrors, sceptres, weapons, and so on. 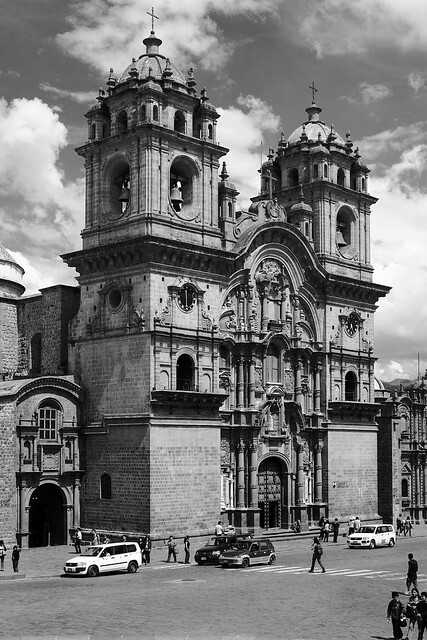 Then the exhibits moved to the Spanish conquest and the effect it had on the Inca population. 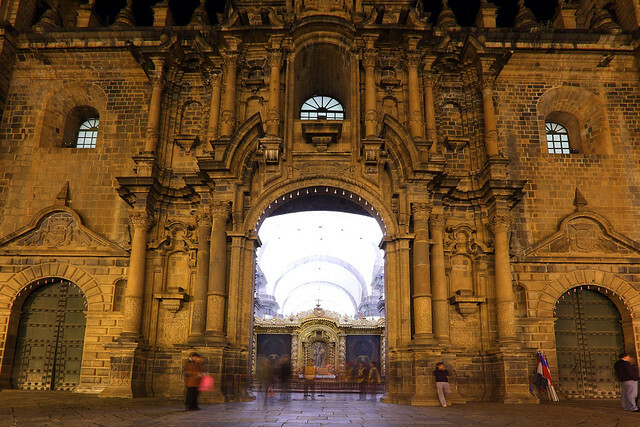 The Spanish let the noble Inca families continue as local nobility over a subjugated population. These Europeanised Incas began to integrate Spanish and Inca designs and aesthetics in their buildings and possessions, as shown by a furnished post-conquest Inca noble room. There were dozens of paintings of post-conquest Inca in traditional costumes done in European oil painting style. Once we'd finished the museum, it was around 12:00. I used the loo there and found the Imodium had worked well. We left to find some lunch and tried a modern looking place on one corner of the plaza that promised pizzas among other things. (Checking later, I think this might have been the restaurant Cava Mora.) They gave us a complimentary pisco sour - small ones that were more lemony and substantially less strong than any others I'd had before. They also gave free pisco sours to a mother and her roughly 14-year-old son at another table. She had to ask to have them taken away. 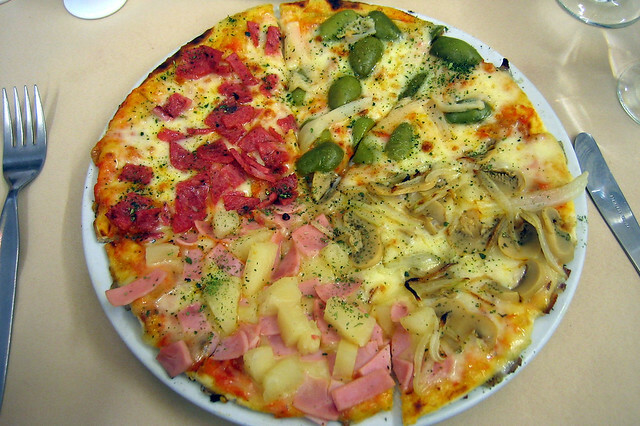 M. got a margherita pizza and I got a cuatro estaciones - quarters with salami, ham and pineapple, mushroom and onion, and olives. They were okay, but the cheese went a bit manky as it cooled down. Not a great meal. A short walk later, we were at the twelve-sided stone to get some photos in the daylight this time. 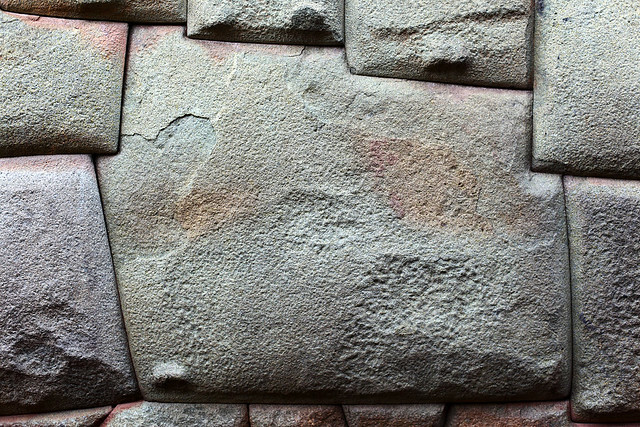 While doing this, a guy started talking to me, asking if I knew why the stone was so famous and then starting to explain about it being related to the twelve areas of Cusco, which he proceeded to show me on a map. I figured he was fishing for tips as a tour guide or something, so brushed him off and concentrated on taking a couple of photos of M. by the stone. We walked back to the hotel to rest for a while. Then we phoned Señor Luigi from Gruppo Esmeralda to arrange the car pick-up so we could go browse some more of their alpaca and silver products. I couldn't figure out how to get an external line on the room phone, and got the reception desk where the lady didn't speak enough English to understand what I was trying to do. So we went down to reception and had the lady ring the number and ask for Luigi for us. He appeared on the phone and said he would send a driver down for us in about half an hour. We waited in the hotel lobby for almost two hours, but no driver showed up. I used the time to catch up on diary writing while M. nearly finished the novel she'd brought to read on flights. It was almost 18:00 and getting dark by the time we gave up waiting and went out again. 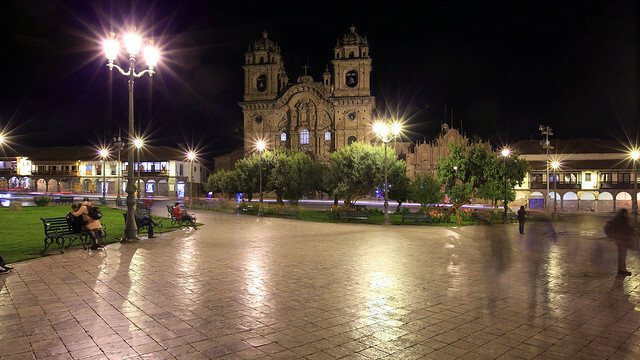 This time I brought my tripod to take some night photos of the beautiful main square of Cusco. While setting up a shot of the cathedral, a young girl popped her face right into my camera and started talking to me, asking if I wanted to buy stuff or take her picture. I tried to tell her no, but she was annoyingly insistent in a kind of sweet, childish way. I maintained a smile as I tried to get rid of her, but she wouldn't leave. Eventually I turned the camera around to shoot the fountain behind me, and she finally got the hint and left us alone. It's pretty obvious why Ale dislikes the thing with tourists paying to take photos of locals and kids. It's a terrible way for children to make anything of themselves. There are dozens of them out in the square at night, pestering tourists when they should be at home with loving parents and getting good educations. After taking a few photos, we went to Ama Lur where we'd eaten a few days ago. 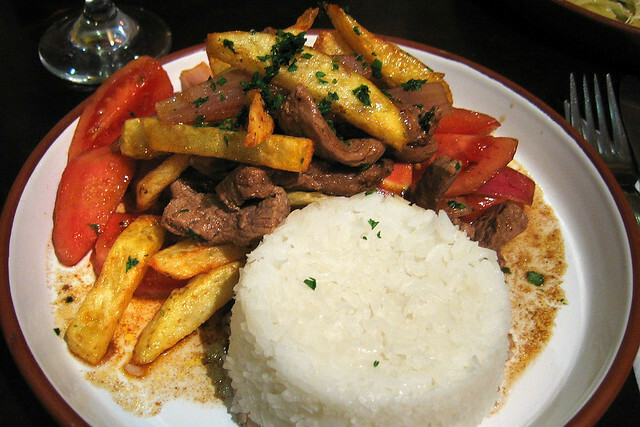 I ordered my first lomo saltado, a traditional Peruvian dish consisting of a mixture of sliced steak, onions, tomatoes, and diced potato, seasoned with spices and served with rice. M. got a spaghetti pesto, which she declared good, except she was having trouble getting the strands into her mouth with the fork. I asked why she didn't use the spoon to twist them onto the fork and showed her how to do it. My lomo saltado was excellent, a simple dish but beautifully spiced and very satisfying. We also ordered garlic bread, but it hadn't arrived by the time we were halfway through the meal, so I reminded the waiter about it. He dashed off and used the telephone near the bar. A few minutes later, a man walked in the front door of the restaurant, carrying a tray of food. One of the things on it was a basket of garlic bread, which the waiter grabbed and placed on our table! The other item was a pizza, which the waiter took to another table. Apparently this restaurant orders out for some of its menu items! The garlic bread this time was more garlicky and buttery and less crunchy than last time, which I thought was an improvement, but M. thought was a disappointment compared to last time. While eating, the spruikers outside attracted in an older couple who sat at the table next to us. They turned out to be New Zealanders, from a farm near Tauranga, and we chatted a bit about our travels. They'd just come off a tour of Argentina and were now doing Peru and Machu Picchu on their own. 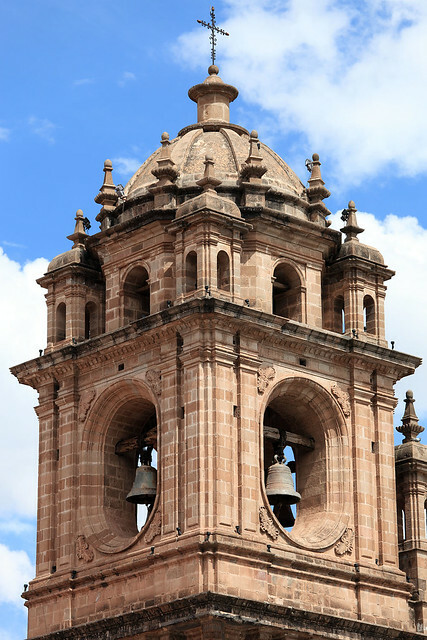 They asked about the market in Cusco, and I told them it was fine, except for the meat section, although being farmers my description didn't seem to faze them. It was also their first day at altitude, so I told them a bit of what they might expect from altitude sickness and how to handle it. We said farewell and headed back to the hotel, arriving just after 20:00. We saw Laura and Kim waiting in the lobby as we paid for our extra night's accommodation there. 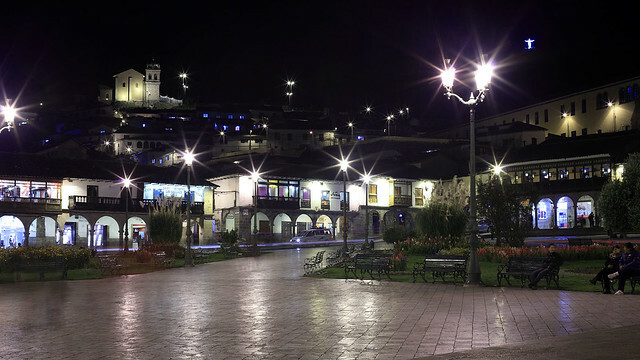 They were apparently going out for dinner with Jian, since Laura vanished to find him and reappeared saying that he was expecting to meet them in the square at 20:00. They dashed off and we said bye, since we probably wouldn't see them again, because we'd be leaving Cusco early in the morning. A mostly relaxing day done, we repacked our luggage and retired early, needing to be up and ready to go to the airport at 07:00 tomorrow. Last updated: Thursday, 31 August, 2017; 00:56:20 PDT.